A watch is a timepiece, usually worn around the wrist or tied on a chain and carried in a pocket. Wrist watches are the most common type used today. Watches have been developed since the 17th century, which enhanced from spring-powered clock that appears in the 15th century. The first watches using mechanical systems. Due to the development of technology, some of the mechanisms used to measure time has changed with quartz vibrations or electronic pulses with battery power. The first digital electronic watch was developed in 1970. 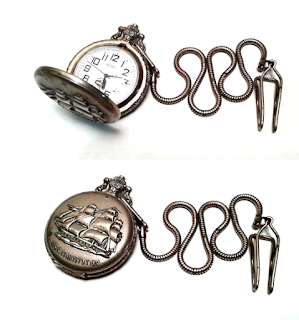 Before wristwatches became popular in the 1920s, most watches were pocket watches, which have cover and tied with chain. The photo below is a Netec pocket watches. Seen engraved on the cover is a sailing ship U.S.S. Constitution. Wristwatches are still very popular even though there is a clock in the cellular phone, in vehicle, and easily can be found in any public place. Watch is more than just something that is coiled around the wrist and help you to stay on time. Watch is an accessory to help to define your personal style. The most fundamental question is when and how I would wear this watch? In the end, a watch is a reflection of you and your lifestyle, such as the clothe you wear or the car you drive. Read also tips for choosing frame and lens for glasses. Watches that you choose should be appropriate to wear for your activities. If your main activity is athletics, shock resistant watches (shock-proof) can be taken into consideration. If you are going to use the watch for swimming and diving, high pressure water-resistant watch is suitable, which has a screw-down crown to withstand high water pressure and waterproof plastic belt (band). Mechanical watches are less accurate when compared to the electronic ones. With frequent mechanical error a few seconds per day, and they are sensitive to position, temperature and magnetism. Mechanical watches are also expensive to produce, require regular maintenance and adjustment, and are more prone to failure. However, the expertise of mechanical watches still attracts interest and popular among watch enthusiasts. Skeleton model watches are designed to show the mechanism (movement) for aesthetic purposes. Mechanical watches are made with high craftsmanship, and considered as luxury watches. If you are looking for a reliable accuracy watch, then a watch with quartz crystal is the answer. 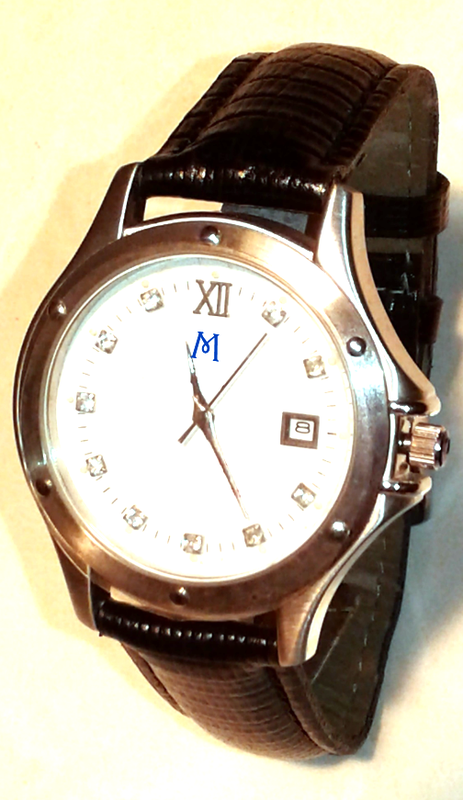 In quartz watch, quartz crystal vibrates approximately 33 times per second. With the power of the battery, the quartz vibration translated into pulses by a computer chip to drive the electronic motor to move watch hands. A casual watch suits the relaxed personality and lifestyle, not too serious, suitable for everyday wear rather than formal occasions. Various colors are available, choose the most suitable color to wear. Watch face should be comfortable and easy to read. Look for watches with features such as a date window and seconds hand which are useful to you. Choose a comfortable band materials. Leather material is usually lighter weight and better fit on the wrist, but not waterproof. Metal bracelets are usually heavier, water-resistant, and more durable. Rubber bracelets usually have a casual look and water resistant. Casual watches produced by Kenneth Cole, Nautica, Swiss Legend, Tommy Hilfiger, and many more. Online shop to buy wrist watch for man and woman (unisex). Thin watch that will be fitted neatly under your sleeve, wear a bigger and thicker one if you want to stand out. Dress watches for men and women may have a diamond or gemstone accents. This watch is suitable for formal occasions, such as when working in the office. Metal bracelet is usually better, leather bracelet also looks good. Usually looks more simple but functional. Their brands include: AK Anne Klein, Bulova, Citizen, Seiko, and much more. Photo below shows dress watch by Baume & Mercier. 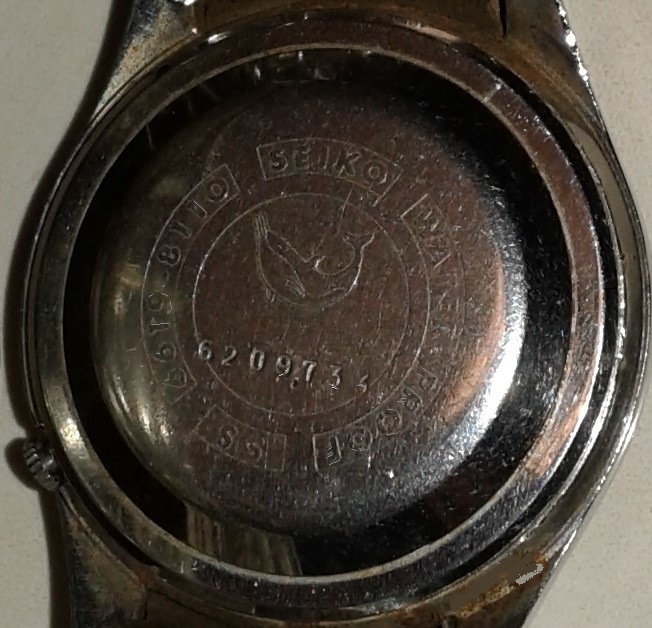 The photo below is a Seiko Sportsmatik 5, automatic watch 21 jewels, my private collection. It is first produced in 1963 and still popular today. This Seiko relies on five advantages: a mechanism that gets energy from the wearer's hand movements (self-winding automatic movement), water resistance, day and date indicators, recessed crown, and a durable body that is rust resistant. 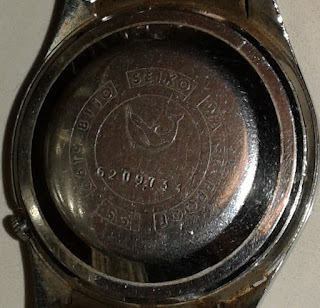 Photo below is showing the back cover of that Seiko wristwatch. 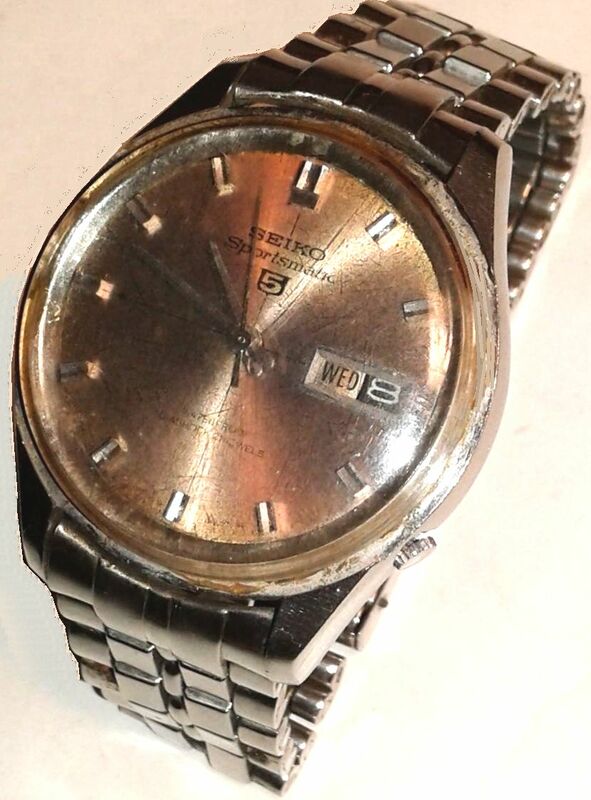 According to the interpretation of Serial Number 6209734 and Movement Calibre 6619 and Case Code 8110, this Japan watch was made in 1966 or 1976 in February. Those data can be checked on the WatchSleuth page. Look for watches that are easy to read, such as a digital watches. Sports watches are usually larger in order to get space for timer (stopwatch), alarm, and other features found in a sports watch. Chronograph is the type of watch that can be used as a stopwatch (timer) making it suitable as a sports watch. Select the appropriate level of water resistance for your needs. For example, for divers should seek a minimum rating of 200 meters depth of diving or 20 atmosphere (atm) water pressure. On analog watches, look the ones with rotating bezel or tachymeter to help measure the time at a particular event. 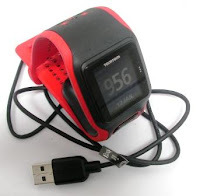 For serious runners, cyclists and motorists, digital watches provide a variety of useful features. A marathon runner uses the watch to determine strategy in a race. Marathon runners need to know when it's time to run a bit slower to conserve stamina. Marathon runners also need to know when to run faster in order to improve the position or rank. It is not very easy to read the watch as you run. Watch with a large digital display is easy to read, it is suitable for use when you're running a marathon. There is also a digital wristwatch that uses LEDs so that the figures appear brightly colored, not black, so it is easy to read when it's dark and as you are running. Some sports watches are equipped with GPS (Global Positioning System) to measure speed, distance, and record the coordinates of traveled routes. Some also are equipped with Heart Rate Monitor, to ensure heart rate is enough for lose weight and still under maximum rate. The black and red colored watch in the photo is TomTom Runner Cardio. It is docked and ready to connect to computer or laptop via USB plug to upload data and recharge it's battery. Tachymeter is a scale around the edges an analog sports watch. Tachymeter scale marks at start, so then it can be seen how long an event lasts. Tachymeter can be used to calculate speed based on travel time within a known distance, or measure distance based on known constant speed. 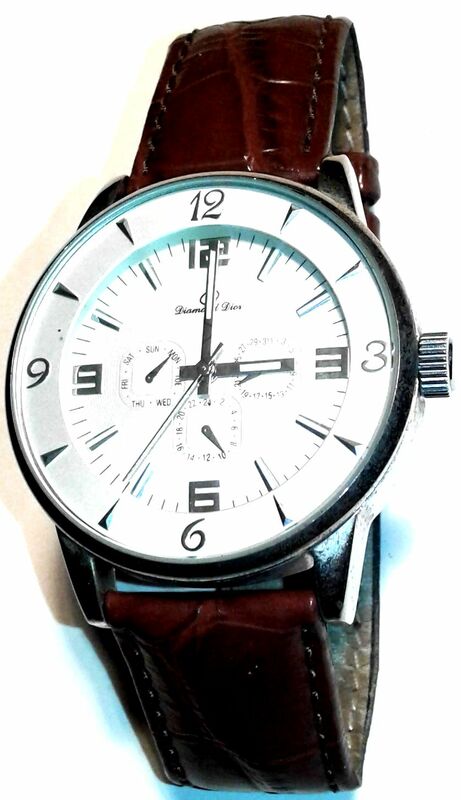 Aviator watches are about similar to sports watches. Aviator watches suitable for flight. These watches are equipped with time for multiple time zones, so pilots can find time for each different time zone. Some Aviator watches are equipped with a compass. Note the band's material that should be based on personal preference and the type of sport. The most popular band material for sport watches is a plastic or rubber bracelets. Sport watches brands include: ARMITRON, Casio, Puma, REACTOR, Timex, TomTom, Garmin, Nike, Adidas, fitbit, Polar, and more. If you are looking for fashion watches, then all the rules are changed alias no rules. Fashion watches can update your look or help accentuate the beauty of your clothes. Fashion watches selected according to personal taste. A variety of models, styles and colors are available. Some designs made from precious metals and equipped with precious stones. Look for watches that exude your artistic sensibilities, or can be considered as an extension of your personality. Big chunky watches are trending today, with men's watches larger than 50 millimeters (2 inches). To try out a new trend, try playing with your accessories. Not everyone can wear the hot colors and vivid on clothes, but everyone can wear vivid color watches. Do not be afraid to try different styles and colors for your watch. Now is the time to be fashionable. A variety of fashion watches brands include: GUESS, Ed Hardy, Invicta, Swatch, TechnoMarine, and much more. Sometimes referred to as Haute Horlogerie, luxury watches suitable for collection and investment because the price may increase over time. With luxury watches from high-end Cartier, Omega, Movado, and TAG Heuer, you pay for the best watches, fine workmanship of the expert, and exclusivity (smaller amounts are produced for individual models). A good watch is a beautiful heirloom to be passed on to the next generation. Luxury watches are often categorized as jewelry, not as a timepiece (watch). 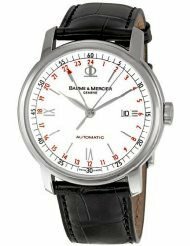 Mechanical watches are still very popular as luxury watches. Consider automatic watches (harness energy from the movement of your hand) with visible mechanism (skeletonized dial, caseback show) that displays the beauty of the mechanical (movement) and the maker skill. Of all the luxury watches made in the world today, watches from Switzerland still got the highest reputation as a wealth of knowledge and infrastructure built in the Swiss watch industry over the centuries. Keep in mind that a watch can only be given the label 'Swiss Made' if the movement is manufactured, assembled, and inspected in Switzerland. A watch may have Swiss movement if the automatic movement was made in Switzerland and the watch was subsequently assembled elsewhere. Modern mechanical watches are made with great precision, with very hard material and corrosion resistant, with very hard yet tough anti scratch crystal glass, so it can live a long and suitable as an investment or to be inherited. 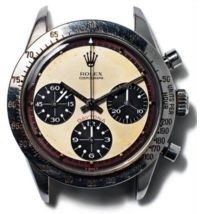 According to Forbes, this Paul Newman's Rolex Daytona 1968 hit a record of wristwatch price at auction, the final price is $17.8 million. Rolex wristwatches for men and women at Amazon. Luxury watches made by: Cartier, GUCCI, Movado, Omega, TAG Heuer, Rolex, and many more.